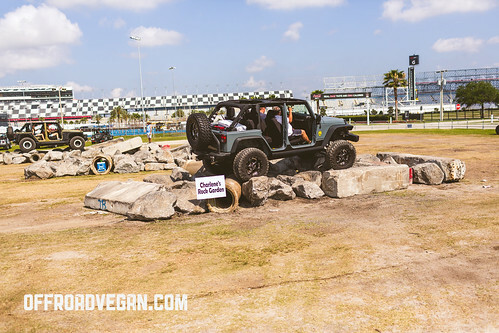 Day 4 began like all other Jeep Beach mornings – waking to the warm Florida humidity, Dunkin Donuts coffee, and beautiful sunlight bouncing off the ocean. 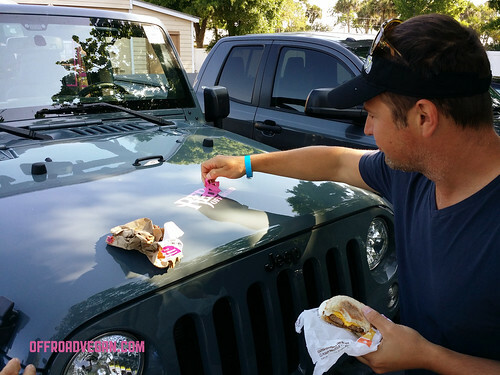 Rule 1 about Jeep Club: When borrowing a friend’s Jeep, apply the biggest pink decal you can find. Little did I know it would end very differently, with some Jeep damage, me in Urgent Care with stitches in my knee, and a very crazy, crazy party. Jason and I headed to the Daytona Speedway infield to help our buddy Phil repair the broken yoke on his rear drive shaft. 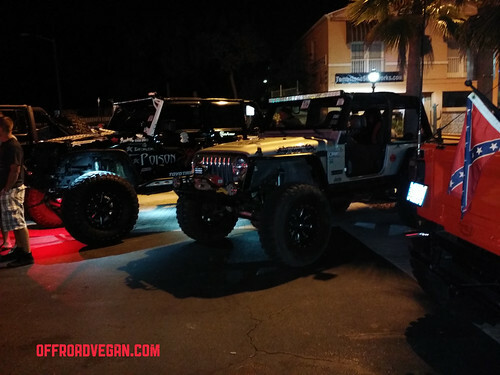 The previous night, we bumped into Jon Detmer, a Jeep guy that knows far more than me on Jeeps, and especially YJs. Not only that, but he had a spare yoke and shaft at his shop! So we worked on getting Phil back up and running. Once Phil was all set, it was Jason’s turn to break something. His new 2014 JK has had some really nice Gibson exhaust tips. On the final drop off the faux rock garden, he had no choice but to drop at an angle, but that still resulted in these tips being smashed flat. The last drop as seen in the middle of the image is what smashed on Jason’s exhaust. Removing and prying these tips off and open is actually not very easy at all. We soon realized that to remove these tips, we needed some tools. After the common vegan stop at Taco Bell, we headed to Pep Boys to kit up. Shortly after, we were sitting on 100 degree pavement, hammering things. The last moments of my intact knee. The best way to remove these tips was to hammer them off a little, then hand “wiggle” them a bit more. Then repeat. Just as the driver side was about to come off, Phil gave it one good whack with the hammer for good measure. It flew off at the perfect angle, trajectory, and speed to enter my right knee for about a half an inch. The resulting slice, created a pretty good stream of blood. Luckily, I had one of Orange County’s best as a friend, so I was quickly gauzed and stuffed, and heading to the closest place for some stitches. After a little R&R back at the condo, we got dressed and ready to hit the biggest party of Jeep Beach: The Jeep Beach after party at Main Street Station in Daytona Beach (which is appropriately classified on Yelp as a dive bar). Jeeps at the Main St. Station. 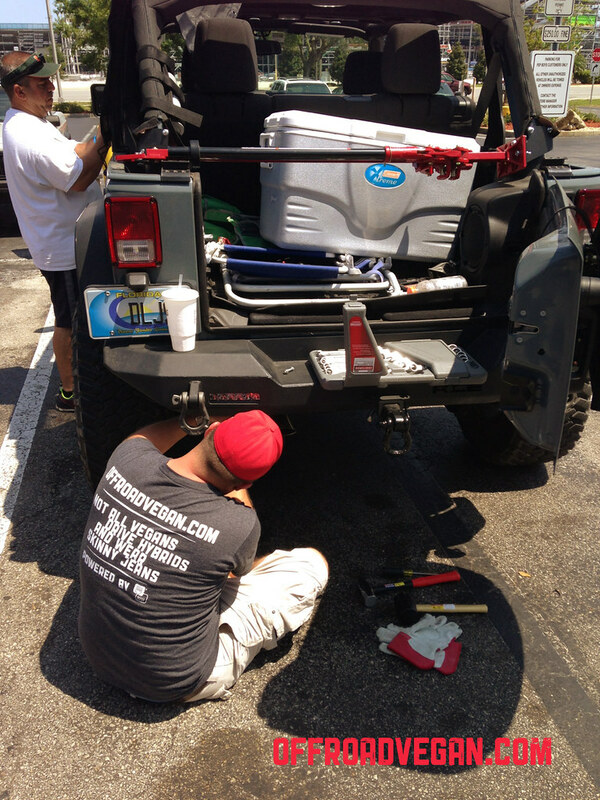 I roamed around and checked out all the beautiful rigs, and even helped a guy out with an alignment issue on his JK. 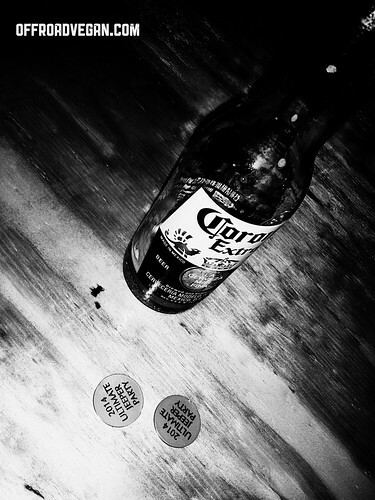 Jeep Beach drink tokens: The new currency. I will spare the details of the remainder of the party. It was debauchery squared at that place, and I was pretty happy we left on the earlier side. 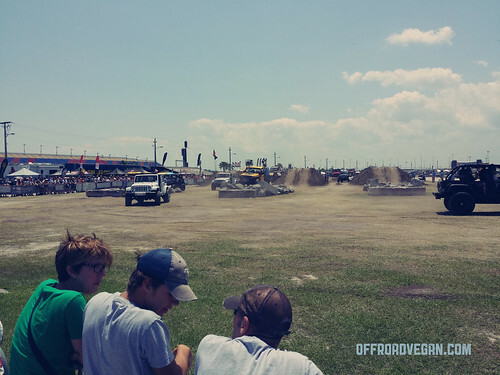 I had no idea the Jeep community could throw down like that. Some we pretty crazy. I wonder when the last time this Jeep saw dirt was…. 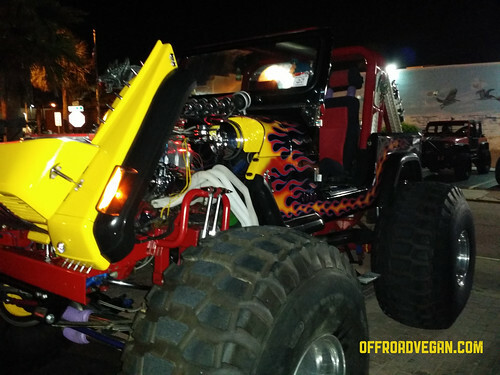 I was the DD, so we made it back uneventfully and crashed to prepare for the next morning – the Jeep parade down the beach! Haha! Yep. I am getting old, sadly!! Sorry we missed each other for the final parade….